Barefoot this moving boulder of a Dwarf is 4 feet tall by his people’s measurements (1.2 meters by Elven metric), and 200 pounds. As a Prince of the Korin Thatr his beard is braided into a massive singular “Thane’s weave” with Korobite (gold & silver looking metal, used in Old Kingdom Dragon Coins) bands. He bears a genuine royal Dwarven signet ring! The only armor he wears on his arms are leather and steel forearm bracers and Korobite knuckle studded gauntlets when fighting. All of his boots have Korobite plated toes and steel shanked heels. Most of his robes are plain “for a prince,” and he will often go bare chested. Both of his arms bear tattoos up to his chest and shoulder blades. While almost never seen his right palm bears a tattoo of the “Eye of Ra” to guide it in being just. His left palm bears “Bennu’s flaming Phoenix Bird” to guide it to where retribution is needed. Picture from @parenzip on Twitter. Paired Axes 7 N/A +2 N/A N/A FYI: The + 2 to Parry from Monk Bonus. “Dragon’s Gift” 6D6+30 Two handed (4D6) for big threats. 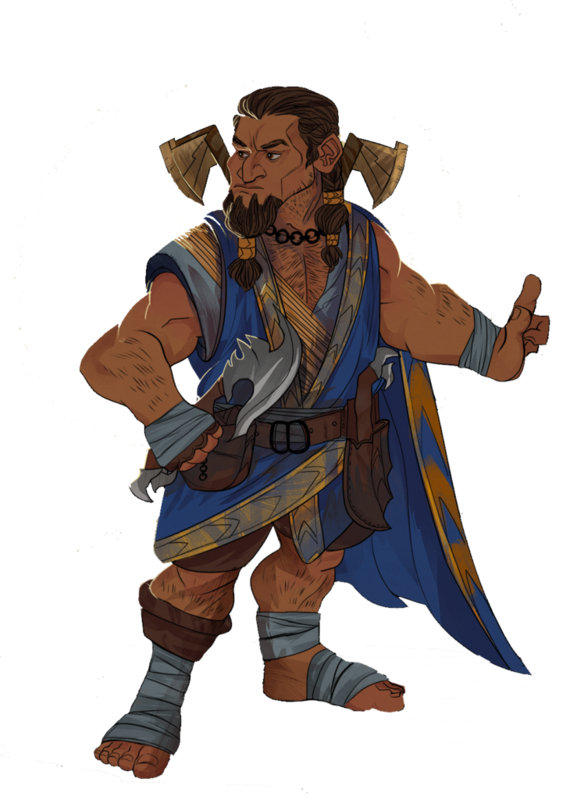 Dwarf Made: +6 to damage, +1 to Parry. 5D6 + 28 Owns two for close combat. Handles are shorter for more control. Throwing Axes 2D4 + 24 Owns six for close ranged targets. Meat Cleaver 1D6 Torrun uses this like a utility knife. Axe Power Strike + 1D6 Damage Must roll Nat. 18-20 the victim of the stick power strike loses initiative, loses one melee action and there is a 01-50% chance that he will drop whatever weapon he was holding (only drops one weapon if using a pair — victim’s choice of which). Parry Arrows with Axe N/A The monk can attempt to parry arrow attacks! He is -2 to parry arrows, darts, or thrown objects, and -6 to parry crossbows and such. The character can only attempt to parry the projectile attacks of one opponent at a time and must see the attack coming. Axe Fighting Bonuses N/A In addition to W.P. Battle Axe bonuses, the monk is +1 to parry at levels 4, 8, and 12. One extra attack per melee round when using any axe. Spirit Strike Triple Damage! An attack that draws on the character’s inner spirit with mystical effect. It can only be used against dragons, elementals, demons and other supernatural beings and creatures of magic! It can be inflicted with a punch, kick, Axe (any). Cost 2D6 P.P.E. per use. Punch Attack 2D4 + PS (24) Add +2 to damage if wearing gauntlets. Korobite Knuckles allow damage to supernatural creatures. I.S.P. Cost: Small: 3, medium: 8, large (over 20 lbs/9 kg): 8 +1 per every 10 lbs (4.5 kg) of weight. • +3 to strike with telekinesis; physical/skill bonuses to strike do not apply when telekinesis is used. • +4 to parry with telekinesis, by using a controlled object to parry or sheer telekinetic force to block an attack. Counts as a medium, heavy object; costs 8 I.S.P. Add 1D6 for each additional 20 lbs (9 kg) of weight. A telekinetic punch will inflict 4D6 plus P.S. bonus, and a kick will do 5D6 plus P.S. bonus. The I.S.P. is spent whether or not the punch or kick actually hits the target (roll to strike as normal). The power is used in conjunction with a normal, physical attack, so the telekinetic attack can be parried or dodged by the enemy. Every time the power is used, the psychic must make a save of 14 or higher, or he will take 1D6 points of damage himself as a result of wrenched muscles or a dislocated joint from the extra strain on his body. Dragon’s Gift This Magical War Battle Axe is a transformable weapon and becomes a Prince’s Warrior Monk traveling robe with hood. Parchment of Partners Also known as the Page of Heroes, a Parchment of Partnership is a scroll that anyone of a certain stage in life can utilize to call forth an assistant that will help them and remain loyal to that person for life. Very valuable, many duels, jousts or other battles are waged over these magic items. Benefit: When read by someone of 4th level or higher a Parchment of Partnership this magical scroll summons an NPC of a class chosen by the player of the 1st level of ability. This NPC is fiercely loyal to the PC and will follow orders without question, being of the same alignment/outlook. This NPC gains experience at half the rate of normal characters (rounded down). Magical Itching powder Very uncomfortable, lasts for 2D4x10 minutes or until washed off. Victim is -4 on initiative, -5% on skills and is distracted. Affects bare skin only. May meditate for 11 hrs. Holy Water 4 Belt Steel Vials with wax sealed stoppers. Ceremonial Robe Dwarven script for the Pantheon of Light embroidered as trim. Axe Harness One Worn Battle Axes carried on sides Throwing Axes carried as follows: 2 rear mounted; 2 front mounted; 2 on shoulder straps. 1-Stored Korobite Knuckles Steel reinforcements. 1-Stored Korobite Toe; Steel heel reinforcements. This remains a secret until he is played.